Cyber Monday: Are You Protected? Anticipation is growing as the year heads toward its crescendo: the holiday season that ushers in the new year. Black Friday and Cyber Monday bargains are already appearing during retail’s busiest season, and while this activity may not be exciting for many, for businesses without proper cybersecurity, it can spell true disaster in often overlooked areas. For example, customer databases can be breached, leaving many consumers vulnerable to attack. This can damage the trust between a business and their customers, ultimately affecting the company’s bottom line. Managing the risks will help to make it a seamless process where customers don’t have to trade the long lines and bitter cold of Black Friday for lasting, and often irreparable, damage to system databases. Hackers and thieves often look for networks with low security and attempt to use information to their advantage, which has a detrimental affect on those who fall prey to their strategies. Finding an effective way to use managed IT services to implement security measures would help in this regard. 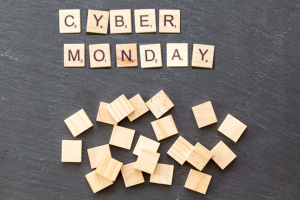 By employing skill in strategizing security measures, weaknesses that are often exploited during a high traffic time, like Cyber Monday, can be addressed. One of the first lines of defence is having proper security for phone systems. Business phone systems (VOIP) have become an industry standard and give a layer of necessary security. One basic preventative step in guarding against security threats is having a good antivirus software protecting your network and databases. While little can be done to prevent the attempts of those with ill intentions when it comes to personal data, having antivirus software can guard businesses against dangerous websites that may cause unwanted damage within the computer or network. If a problem does arise, having ways to quickly resolve the issue is key. While technology has its place, the value of a helpful and communicative tech support team can help to ward off potential or realized damage done by security threats. Tech support can help by using systems for disaster recovery to help save information from databases that have been compromised. Increasing your company’s cybersecurity measures is one way of bringing you more peace of mind during Cyber Monday. With proper methods in place, it can be remembered as the day the deals of the year blew everyone away, rather than being marked by an IT disaster. To make sure you’re protected this Cyber Monday, get in touch with SJP Network Solutions. We are an experienced and reliable managed IT services provider and will give you and your customers the peace of mind needed to make this a wonderful holiday season.